While he takes the year off to write and return to the studio, Tom Petty is moonlighting -- he's taped four episodes for the next season of King of the Hill, which begins in September. 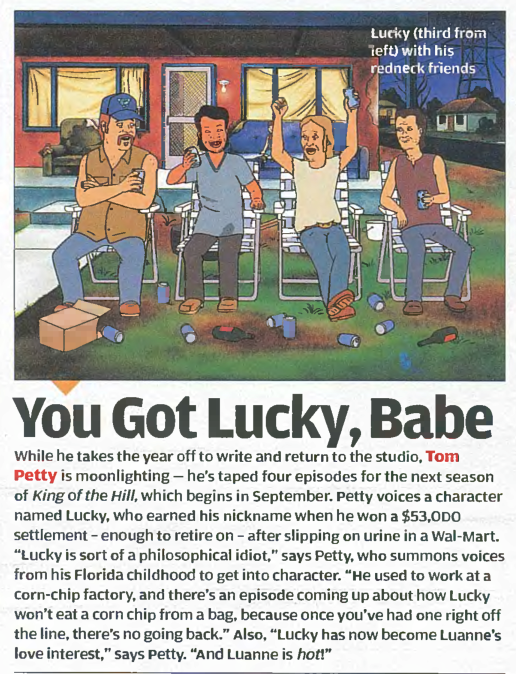 Petty voices a character named Lucky, who earned his nickname when he won a $53,000 settlement -- enough to retire on -- after slipping on urine in a Wal-Mart. 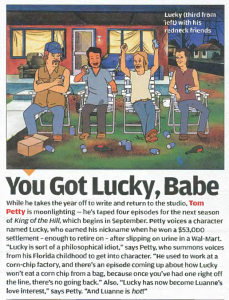 "Lucky is sort of a philosophical idiot," says Petty, who summons voices from his Florida childhood to get into character. "He used to work at a corn-chip factory, and there's an episode coming up about how Lucky won't eat a corn chip from a bag, because once you've had one right off the line, there's no going back." Also, "Lucky has now become Luanne's love interest," says Petty. "And Luanne is hot!"